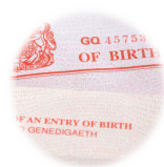 What is a Long Birth Certificate - UK Record Office - Lost Original Replacement Need Copy Obtain Duplicate via mobile. The replacement certificate will normally include full name of child, mother's name, father's name (when registered) DoB, where born and registration district. The main difference between the two certificate types is that the long birth certificate shows the named parents for the child at birth.